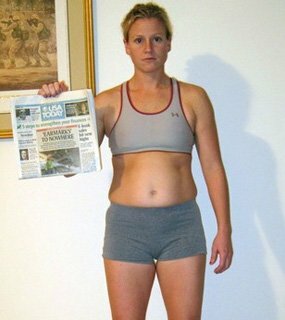 Sarah trained to not only burn fat but build muscle. I must give credit where credit is due! My trainer Allison Ethier created all my training regimens. She aimed my training at not only fat burning, but also building lean muscle. She had me lift moderate-to-heavy weights with rests in between each set. Allison was very good at changing up my routine to keep my body guessing and to make it interesting as well. As the 12 weeks progressed, the training grew more rigorous to avoid hitting plateaus. I began the challenge doing cardio 4 times a week, 2 steady state cardio days and 2 HIIT cardio days for 20 minutes! And I finished the transformation doing the cardio I posted above. I was amazed at the endurance and physical fitness level my body adapted to. It was a lot of tough work, but also very rewarding. Sarah takes a moment in the hallway to reflect on her newfound hotness.